Various beaches in Alicante and Baleares have closed following the appearance of the Portuguese man-of-war species. This is a species that appears to be very similar to a jellyfish and they are highly venomous and terrifying swimmers. However, scientists urge people to be calm. Consequently, we are able to unveil some truths and myths about this Atlantic species. It has the appearance of a jellyfish and, in fact, many considerate it one, but the Portuguese man-of-war or Physalia physalis – it’s scientific name- is in reality a colony of different organisms that dedicate themselves to different functions. The exterior part, buoyant and most recognizable, is a species of a transparent bag full of gas of about 30 centimetres, which serves as a sail to transport the species as it is dragged by the wind. The submerged part is formed by a series of tentacles that can measure up to 50 metres long, although normally they are around 20. Some are responsible for digestion, others for reproduction and others for capturing prey. It is the latter, the dactyloids, that release the poison. It is certain that there have been some cases of death that have been registered following the sting of a Portuguese man-of-war but Laura Prieto, investigator at the Institute of Marine Sciences of Andalusia (the centre attached to the Superior Council of Scientific Investigations (CSICC)), claims that their sting is not deadly except to those who are allergic to their venom, and that it is not more dangerous than others. “It hurts a lot more, that’s it”, she points out. It is its intense pain that can produce “a neurogenic shock”, the Council of Andalusia warns who detail that the venom has neurotoxic, cytotoxic and cardiotoxic properties. “Evidently if it stings an older person with heart problems, the fright and pain can cause the heart to stop, but they would not die from the venom”, says Prieto. Their very long tentacles also tend to become tangled and stick to each other when we try to remove it so the sting multiplies. Why are they appearing on Spanish beaches now when they weren’t before? It is not the first time that the Portuguese man-of-war species, which comes from the Atlantic, has arrived on the Mediterranean coast; many more arrived in 2010 than this time round. However, they used to come during the months of January, February or March, and not so close to the swimming season and summertime as it is happening now, which is why so much alarm has arisen this time. Why have they come? Is it something to do with climate change? Their arrival has something to do with the meteorological conditions but it is not related to climate change, at least as far as it is known. Following the large arrivals of the Portuguese man-of-war species to the Mediterranean coasts in 2010, a group of investigators studied the causes of its appearance and concluded that the explanation can be found in the North Atlantic Oscillation, a meteorological indicator that measures the difference of pressure between the anticyclone of the Azores and the depression of the island that serves to forecast the weather phenomena on Europe. When the index is negative, there is usually bad weather in the south of Europe with a higher number of precipitations. Normally, it does not exceed an index of -2 but during the winter of 2009-2010, it reached -4.64 (the lowest index in 150 years). 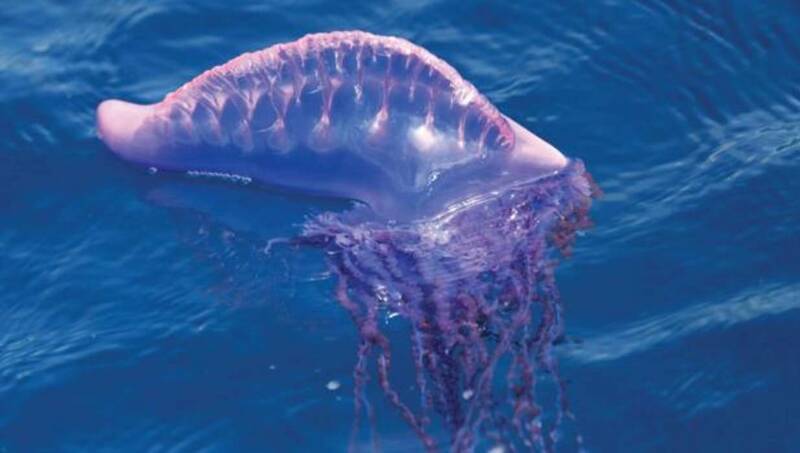 The result was intense rainfall that added to the strong West winds for many consecutive days, which brought the Portuguese man-of-war to the Mediterranean according to the scientists in an article that was published in the Nature journal. This year an atypical climate has also been added, with a cooler spring and delayed storms that have made the Portuguese man-of-war stay in the Mediterranean for a longer period of time than they usually do. They started arriving in January and continue to arrive today, although with much less intensity. So I won’t be able to swim in the sea for the whole summer? One of the good things about the Portuguese man-of-war species is that they are quite easy to spot, as the exterior part that floats above the water is visible. The personnel in charge of management of the coasts remove them if they see them and bathing is prohibited if there is danger. How long they will stay or not depends first on the wind and then on the temperatures. The Portuguese man-of-war does not survive at very high temperatures, so they are more likely to die. “There is no historical record in which the Portuguese man-of-war have survived the summer. Never “, emphasizes Laura Prieto, who asks to lower the alarm.